Paul Ryan won’t hold public town halls due to fear of protesters. 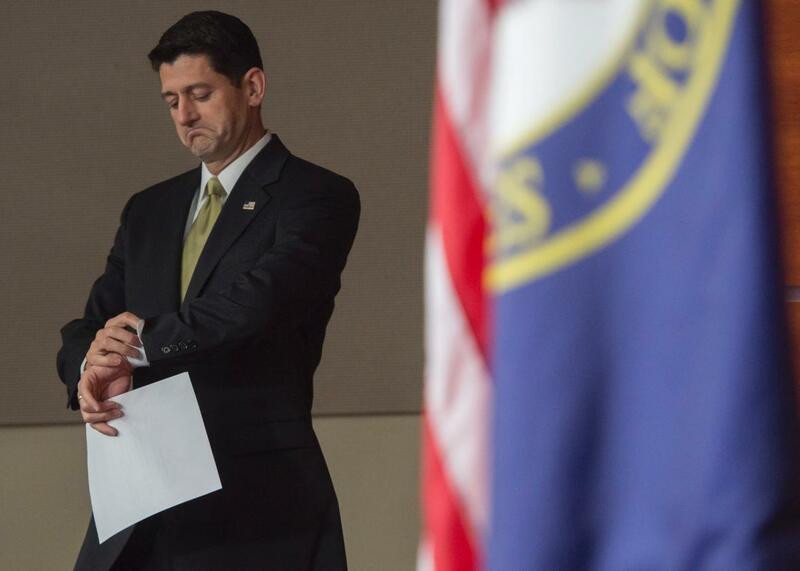 House Speaker Paul Ryan checks his watch as he arrives for a press conference on Capitol Hill in Washington, D.C. on June 29, 2017. House Speaker Paul Ryan won’t hold public town hall meetings because he’s concerned about protesters coming in from outside his district. Ryan, who once seemed to relish overflowing town halls, seemed to make the policy official after holding several closed-door meetings with constituents. Ryan is hardly the first Republican to eschew town halls at a time when these meetings with voters often turn into raucous critiques of the GOP efforts to repeal Obamacare. Earlier this year, Rep. Peter King said he wouldn’t host town halls because they often turn into a “screaming session” that don’t help anyone. “It really diminishes democracy if you’re gonna show up to a meeting to just scream and yell,” King said in February.